In the January 1981 BCM (page 4) G.H. Diggle wrote that Staunton would have cut his throat before penning the hideous expression ‘grandmaster norm’. We seek other examples of linguistic barbarisms. One such is the remark about playing in several ‘Swisses’. Regarding ‘a perpetual’, an old sighting of the abbreviated Americanism ‘a perp’ may be noted: ‘Since perpetual check or “a perp”, as it is commonly called, occurs often enough during the course of play, it is definitely a worthwhile subject for study.’ That was written by I.A. Horowitz on page 87 of Chess Review, March 1954. A caption on the same page began ‘A Perp at Need’. In C.N. 1405 we had ‘back rank mated’; we now note on page 220 of the algebraic edition of Keres’ Practical Chess Endings (translated for Batsford by John Littlewood): ‘White is himself zugzwanged after 1 Bd4+ ...’ Next somebody will be zwischenzuged. In Réti’s day such gibberish as that last sentence would have been unmercifully expunged by a member of the editorial staff. Kasparov’s declarations frequently begin with ‘Okay’, a routine example being ‘Okay, he played Rf1’ (page 103). On page 116 we are even given: ‘Okay, now I think I’m okay’, with several further uses of the word in the rest of the game, which he loses. The book has frequent printing errors (e.g. ‘Ronih’ on page 30 and ‘lessor mortals’ and ‘en pris’ on page 167), but although our review has concentrated on the irritating editing defects, there is no denying that the actual chess content of The Brussels Encounter is highly instructive. Those citations prompt some general thoughts. If paragraphs can begin with ‘Okay’ and ‘Yeah’, they can finish with ‘Just saying’, ‘Nuff said’ and ‘End of’. Instead of ‘in my opinion’, there is ‘for my money’, ‘my ten cents’ worth is that’ and, more assertively, ‘fact is’. A bewildering set of abbreviations may be deployed, such as ‘fwiw’ [for what it’s worth] to introduce, with specious diffidence, an opinion worth nothing. Reference is found to people (‘guys’ or ‘dudes’) who ‘took to Twitter’ to ‘slag off’ this or that. Or ‘took to social media’. Or ‘took to the comments section’ of a webpage. We are told what has been posted not at ChessBase.com but ‘over at ChessBase.com’. An appeal for information becomes ‘Anyone out there know ...?’ Prose is sprinkled with ‘ain’t’, ‘dunno’, ‘gotta’, ‘innit’, ‘kinda’, ‘nah’ and ‘wanna’. In debate no expression is too colloquial (‘C’mon, cut us some slack, will yer?’). Simultaneously such writers may try to look posh, with ‘commence’ instead of ‘begin’ or ‘start’. For examples of the ‘painful amalgam of coarseness and pretension’, in a book on the 1992 Fischer v Spassky match, see Instant Fischer. Source: BCM, April 1943, page 74. On page 22 of the 1 January 1950 issue of Chess World there appeared a feature entitled ‘The Zugzwanger Zugzwanged’. We note an increasing tendency for ‘writers’ to end sentences, or pseudo-sentences, with a question mark rather than a full stop, e.g. in cases where the opening words are ‘I wonder if’, ‘I thought that’, ‘He asked whether’, ‘Perhaps’, ‘Maybe’, ‘Possibly’ and ‘Surely’. 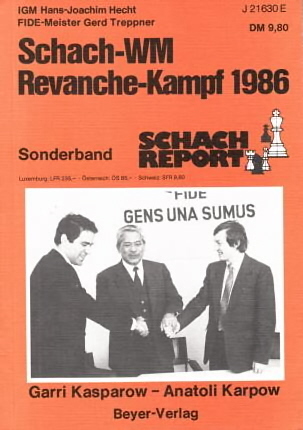 Source: page 11 of Chess Comet Charousek by Victor A. Charuchin (Unterhaching, 1997). Photographs often have poor, lazy captions. How to Write about Chess mentions how the sight of players laughing or smiling together will prompt the statement that they are ‘sharing a joke’. Chess news reports indicate a growing belief that prose is somehow enlivened if the plainest words are avoided. When a player wins first prize in a tournament, the verb ‘wins’ commonly loses out to ‘bags’, ‘claims’, ‘collects’, ‘grabs’, ‘picks up’, ‘scoops’, ‘takes home’, etc. Another addition to the musings on chess and the English language concerns the use, particularly in the United States, of ‘would’ in historical narratives. For instance, ‘Alekhine died in 1946, and two years later Botvinnik would become world champion’, instead of simply ‘became world champion’. To lapse into journalese, Carlsen and Anand are ‘set’ to play a ‘revenge match’. Use of that latter term (instead of ‘return match’ or ‘re-match’) is not new, and the oldest instance that we recall is on page 169 of CHESS, March 1947: a reference to ‘the Alekhine-Euwe revenge match’. The writer was Botvinnik (see Interregnum), and ‘матч-реванш’ is a common term in Russian, just as‘Revanche’ occurs in the equivalent German and French phrases. Whether ‘revenge match’ is good English is debatable, but it was used by Fred Reinfeld (‘a prompt revenge match’ between Euwe and Alekhine in 1937) on page 213 of The Great Chess Masters and Their Games (New York, 1952). Another question left for readers to ponder is the best term in case of a series of matches between two players (e.g. how to describe Kasparov v Karpov, New York and Lyons, 1990). The back cover jokes that Byfield ‘first picked up the game when he knocked over his father’s board at the age of two’. The lad done good. ‘Would’ can be strange, and C.N. 8632 (see above) mentioned its unnecessary inclusion in historical narratives (‘Alekhine died in 1946, and two years later Botvinnik would become world champion’, instead of simply ‘became world champion’). Another quirk, favoured by presenters of history programmes on television, is recourse to ‘would have’ to disguise speculation or mind-reading: ‘It is in this room that he would have decided to ...’ Then there is all the prolixity in quizzes. ‘Would you be ready?’ is answered not by ‘Yes’ but by ‘I would indeed’, and later we may hear, ‘I wouldn’t have a clue’ or the frightful excuse for ignorance of something uncontemporary: ‘that would be before my time’. Asked in a chess quiz to identify the player who was nicknamed ‘the Black Death’, a contestant could well use four words instead of one: ‘that would be Blackburne’. A more challenging question is: which chess writer used the pseudonym ‘Eze’? That would be Telling. 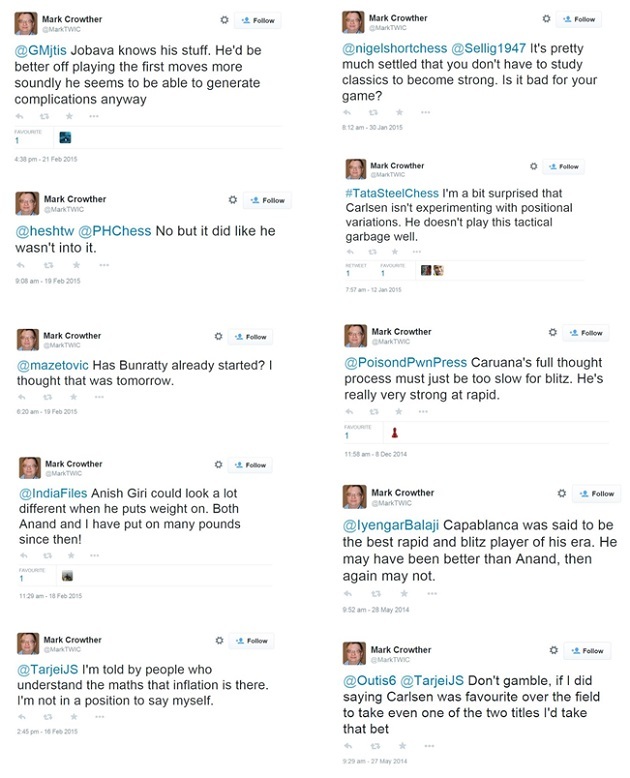 Another quirk of certain commentators, and particularly inferior ones, is the excessive use of ‘just’, almost as much as in television cookery programmes (‘White can just play Bc4 and then just castle and just centralize his rook’/‘Just put it in a frying pan and then just fry it off and just serve it up’). There is also a usage which recalls the days when Peter Jones (1920-2000) was the Chairman of the BBC radio programme Twenty Questions. If a panellist enquired whether the mystery object ‘is something like a giraffe’, he would ask, ‘what is like a giraffe?’ Chess broadcasts frequently contain phrases such as ‘If White just plays a move like Qb5 ...’, meaning ‘If White plays Qb5’. We note too (in chess broadcasts and in television news bulletins) the increasing recourse to ‘because’ as a multi-purpose conjunction: ‘This is the scene in the hall because shortly play will be starting.’ (Or, possibly, ‘will be starting’; it is not only prepositions that are emphasized erratically.) On a more positive note, we have yet to witness an Internet broadcaster employing a formulation favoured nowadays by television journalists when introducing filmed interviews: ‘This is what the Prime Minister had to say’ (rather than ‘said’). During post-mortem interviews, the chess hosts must listen tolerantly to what the players have to say, even if they have to say it with the stream-of-consciousness approach heard in so many sports broadcasts: ‘OK, well, you know, I don’t know, you know, well, maybe he could just have tried to just, OK, maybe, I don’t know, you know.’ Yet at least these unburdenments illustrate the difficulty of chess even for the greatest masters, in contrast to all those atrociously written certainties which some Twitter-users dash off before dashing off to dash off something else. A knight is a knight’ (C.N. 9253) brings to mind the cliché ‘a pawn is a pawn’ (a phrase used in a brief sketch by ‘W.C.G.’ on page 131 of the April 1885 BCM). 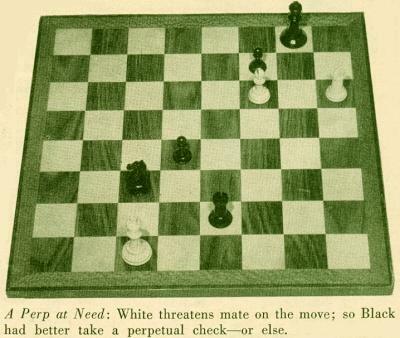 C.N.s 642 and 7673 mentioned ‘an interesting game in all its phases’ and ‘the rest is a matter of technique’, and two others are ‘this move is better than its reputation’ and ‘the pawns fall like ripe apples’. Readers are invited to keep their eyes peeled for any recent annotational clichés which have been spreading like wildfire, left, right and centre. Mike Salter (Sydney, Australia) expresses dislike of annotators’ unhelpful use of the single-word sentence ‘Desperation’ towards the end of games; he has counted 17 occurrences in Lessons from My Games by Reuben Fine (New York, 1958). Fine also used the word frequently in Chess Marches On! (New York, 1945). One example is in C.N. 8353. Among chess commentators ostensibly of English mother tongue, some of the worst prose is still being turned out by Mark Crowther. On 25 June 2015 he posted an obituary of Walter Browne, who, he says, died in ‘Navada’. (Another obvious misspelling: ‘visable’.) Uninterested in treating Browne with respect and unable to construct a basic sentence, Crowther writes that Browne was ‘numerous opens’ and was ‘five medals’. The heading even has ‘Watter’ Browne. A 1988 citation above has ‘uncastleable’, in connection with the king. Another unusual, though older, word is ‘unqueenable’. A heading on page 88 of Easy Guide to Chess by B.H. Wood (Sutton Coldfield, 1942) was ‘That unqueenable rook’s pawn’, and the word was also used, within quotation marks, on page 110 of CHESS, February 1950. Many examples of that writer’s inability to produce correct English are given in our feature articles on him. ‘There are of course slow ways of chasing denied away …’ (page 131). From the context, it would seem that ‘chasing the knight away’ was meant. Another example comes on page 145: ‘it can also crate threats’. With all Schiller’s typos, one could pass denied away crating lists. Bad writers often have an exaggerated liking for exclamation marks. 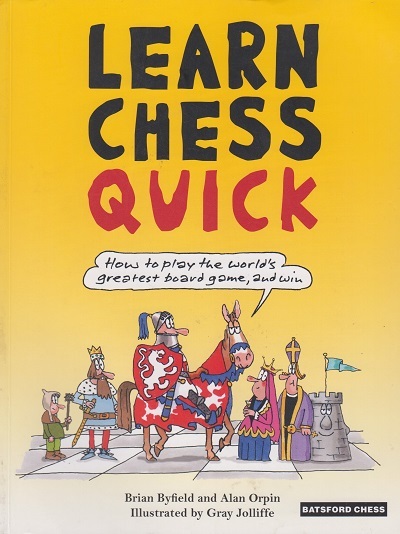 See, for instance, Chess Problems, Play and Personalities by Barry Martin (Beddington, 2018), a book discussed briefly in C.N. 11186. A strident critic of FIDE, Barry Martin misspells a Federation President’s name (page 22), the Federation’s name (page 83) and the Federation’s motto (page 246). Latest update: 9 February 2019.